Although EMACH’s magnet-free SynRM technology gives very good results, adding cheap ferrite magnets in the motor design increases motor characteristics significantly. That’s why company EMACH has developed an ultra premium efficiency (IE5 class) synchronous reluctance motor without rare-earth magnets (SynRM with ferrite magnets). The results of the experimental comparison of the SynRM with ferrite magnets developed by the company EMACH and motors of other manufacturers are presented below. In table Eff1 is the efficiency at the rated speed and the rated torque, Eff2 is the efficiency at the speed equal to 75% of the rated speed and the torque equal to 50% of the rated torque, Eff3 is the efficiency at the speed equal to 50% of the rated speed and the torque equal to 25% of the rated torque. Figure shows the experimental comparison of the EMACH’s SynRM with ferrite magnets (green line) and the ABB’s induction motor (blue line), ABB’s SynRM (purple line), Hyosung’s synchronous motor with rear-earth magnets (red line) at the pump load (quadric dependence of torque on speed). 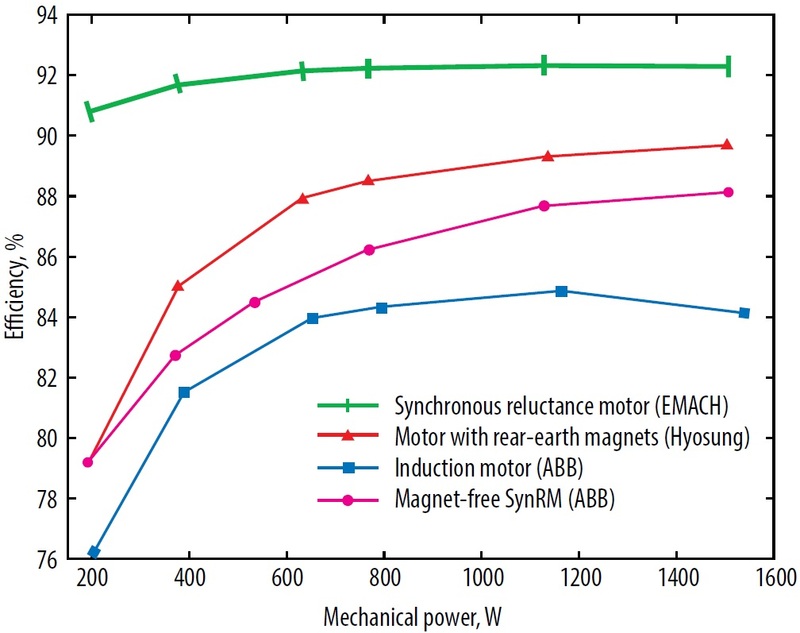 Figure shows that the efficiency of the EMACH’s SynRM with ferrite magnets has highest efficiency among all motors considered here in wide range of speed and power. Adding the cheap ferrite magnets in the motor design makes it possible to increase the motor efficiency by at least 1% and to reduce its mass significantly (almost 20%) in comparison with magnet-free SynRM. The SynRMs with ferrite magnets can replace the induction or permanent magnet synchronous motors and can be applied in variable speed applications: pumps, fans, compressors, extruders, conveyors, mixers, electric vehicles, power tools, household appliances, servo drives etc. EMACH can develop SynRM with ferrite magnets in the various housing (general-purpose, explosion-proof or any housing chosen by client) in wide range of power.